A lot of people will resort to taking their dog to the groomer every time their nails need to be clipped. When you stop and think about how much you’re going to be spending on each and every visit, it’s pretty easy to see why you should consider cutting them yourself. That presents a new problem, though. Most people are going to be uncomfortable when it comes to actually getting down and dirty, and clipping the ends of your dog’s nail. They’re either going to be worried that they’ll hurt the dog, or that they won’t be able to actually get them to sit still long enough to complete the job. That’s where the Safari Professional Dog Nail trimmers come into the picture. They make it easy for you to prevent hurting your dog by clipping their nails too short, which also makes the process easier. Since the process is easier, you’re not causing as much discomfort to your dog, which makes them more apt to sit still while you’re getting it done. Stainless Steel Construction: Maintaining a sharp edge is critical to properly cutting your dog’s claws and doing it reliably. Safety Stop: When the majority of pet owners think about trying to cut their dog’s nails, or perhaps have even already done it in the past, one of the biggest concerns is causing pain or injuring the animal due to cutting them too short. Professional Grade Nail Trimmer: The level of quality in each set of nail trimmers is the same quality you’ll find your professional groomer using. That’s why we mentioned the price of having your groomer cut your dog’s nails. By purchasing a set of trimmers for yourself, you’re easily going to recoup that cost by not having to pay the groomer to do it. A lot of competitors have used lower quality steel, and even softer metals in an effort to save money and increase their profits, but these types of materials present one major problem: they get dull, and get dull fast. 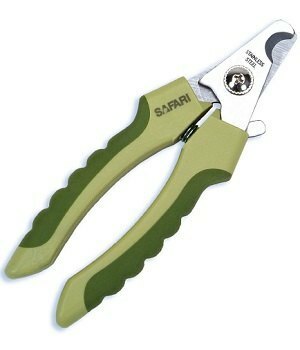 The hardened steel on the Safari trimmers, though, will hold a sharp edge for years. There’s a small area of the nail called the “quick” that needs to be trimmed, but can be hard to see on some animals. That’s why Safari has included a safety stop on the back of the trimmers. Flip it down, and then you can quickly and easily measure a small portion of nail that can then be clipped off -- ensuring that you’re not going to hurt your pet. Some Customers Reported They may Need To Be Sharpened: A few customers have reported that they received the trimmers and they weren’t as sharp as they should be. If this happens to you, you can send them back for a replacement, or even sharpen the edges yourself with a household or kitchen knife sharpener. Trimming your dog’s nails doesn’t have to be a traumatic experience for you, or them. With an integrated safety stop, and sharpened steel blades, you can easily clip their nails and save yourself a bunch of money that would have normally gone to the groomer. To learn more about Safari’s professional dog nail trimmers, and see what other customers have said about them, click on the button below.